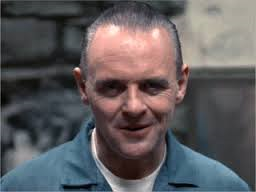 From: "The Silence of the Lambs," "Hannibal," "Hannibal:Rising" and "Red Dragon." Background: For Hannibal Lecter, the eating of people began with revenge, he witnessed the cannibalizing of his own daughter and hunted down each man in the party that did it, killing them all. He grew very intelligent earning his doctorate, but the hunger never stopped. He would grow up to be the most infamous serial killer around. He has escaped from prison countless times and has vast knowledge of several other serial killers in the country.